Both pictures were taken after I had been in the water for about an hour. Living right by the beach allowed me to spend a lot of time surfing when I was younger...early mornings bobbing around in the sea with my dad and brother were a part growing up for me. Truth be told, many years have passed since I've gotten on a board, but today, my darling (and rather persuasive) brother encouraged me to go with him. Although surfing is certainly not the occasion for a "full face," a total lack of products is also not prudent. Le Metier de Beaute Classic Flawless Foundation SPF 8 in #6 and #9 applied and well blended with my Sephora Airbrush. Some people think that foundation and the beach should not mix, but I like the extra layer of protection it provides my freckle-prone skin! More SR Cashmere applied to my lips...I prefer applying a high SPF sunscreen directly to this area rather than using a lip product that contains a lower SPF sunscreen. A mixture of Le Metier de Beaute Lip Creme in "Mum's the Word" and Rouge Bunny Rouge Hues of Enchantment Color Burst Lipstick in "The Plot Thickens." This whole process took me about 3 minutes and completely withstood the tumbling I took in the ocean. My face emerged protected from the elements and ready for my subsequent trip to Starbucks...a girl can burn a lot of calories paddling around! It is fun! Thanks for your sweet comment, Miss Sultana! Never tried surfing, but looks like a lot of fun ;) You look great in your photos. Have you ever tried anything from Becca Cosmetics? If not, I would recommend to try their Butter Balm it has an SPF 20, I always apply before my lipstick or gloss. Or if you want something with a higher SPF, Lavanila makes a great one- The Healthy Lip Screen with SPF 30, only thing I do not like about this one is it's in a pot instead of a tube, at first it's hard to apply, but after you use it a couple of times, it softens up. I use either these 2 every single day since I love my lipgloss and freaked out when I read a few articles on how it increases your risk for cancer on or around the lips, yikes! I use SR Cashmere too and really like it, but I don't like how it does not have an expiration date on it unlike my other sunscreens, even the 2 items I mention above have expiration dates on them :/ Hopefully that will be changed soon or unless I just got a bad bottle? Does yours have exp. date on it? Thank you for the lovely comment and suggestions! I tried Becca years ago but stopped once they stopped selling it at Sephora. The Butter Balm sounds enticing for sure. I like the idea of an SPF 30 (like the Lavanila has), but agree that lip product in a pot can be a little troublesome when you are in a hurry. I haven't noticed an expiration date on my SR Cashmere either, which is a bit odd. With daily (sometimes, twice daily) application, I use up an entire bottle in less than six months, so I guess I assumed that would be within an appropriate time range to guarantee freshness....unless the bottle has been on the shelf for awhile, at which point, that would be a problem! I will check with my local SR specialist to what I can find out! Yay, I'm close to the beach too but I don't surf. Have you heard or tried hair/scalp sunscreen? I love the outdoors and I'm guilty of not using it. That's right...if I am not mistaken, you are in Hawaii?! Which island? I have heard of hair and scalp sunscreen but am equally guilty of not using it...there have been a couple of times when too much sun on the top of my head has made me wish otherwise! Do you have any recommendations? We still have months of sunny and warm weather ahead of us! Excellent, Lola...it does seem like once someone catches the surfing bug, they have it for life!! My brother gets up super early EVERY morning to get his sea time...it just becomes a way of life! Thank you, Louisa! 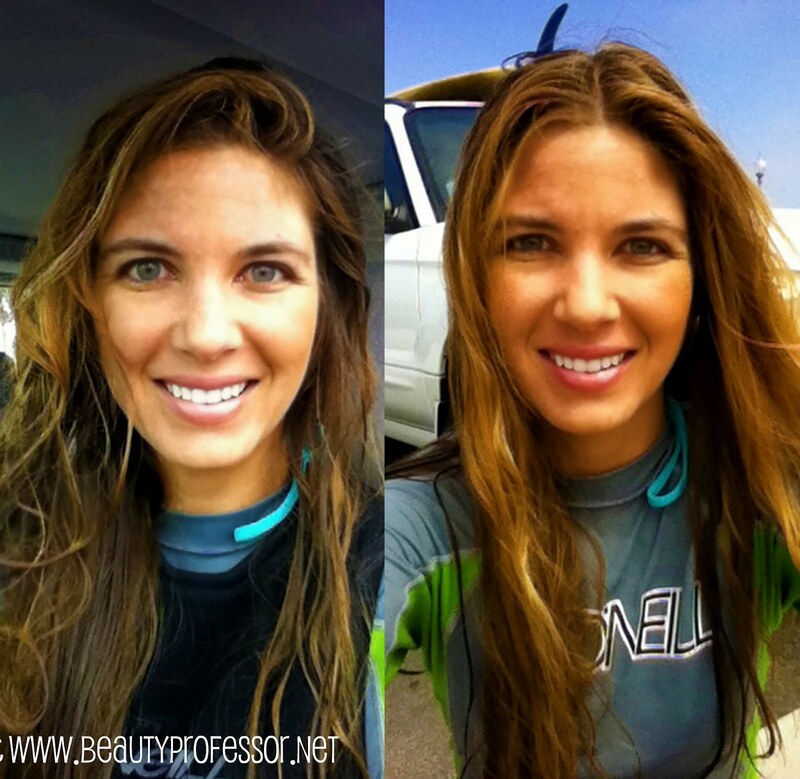 I am glad to hear that I am not the only one using a variety of products before heading into the ocean ; ) Thanks for sharing your routine...I think it sounds absolutely perfect and you are definitely making me want to to try the 3Lab BB cream. I'm an academic and about to move to Hawaii-- just discovered your blog. I blog too :) And I LOVE this post, although no way am I going surfing anytime soon!